Meatless Monday: Nice in so many ways. Answer: How much time do you have? Here are a few facts and figures to motivate you to take the Meatless Monday Pledge. Up to 2,500 gallons of water go into a single pound of beef. Factory farming is inhumane. Stop supporting suffering. Show your global solidarity and be part of the solution. Save the earth – Up to 2500 gallons of water are needed to produce a single pound of beef. In contrast, approximately 39 gallons of water are needed to produce a pound of vegetables. An 8 minute shower uses over 17 gallons of water. That means skipping a pound of meat once a week saves the equivalent of up to 7500 showers worth of water. It also reduces greenhouse gasses and fuel dependence. Save yourself – Reduce Heart Disease and Stroke, limit your cancer risk, fight diabetes, curb obesity, live longer and improve the nutritional quality of your diet. Win NICE prizes – Let’s have some fun. Take a screen snap of your Pledge and post it to the aNiceWorld’s Facebook page. We’ll do a drawing now and then to keep things lively. Learn more from the sites where we got these fine facts and figures: Meatless Monday on Facebook, MeatlessMonday.com, Earthday.org and Wikipedia. 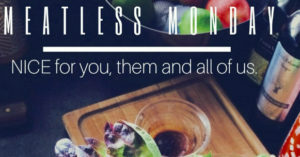 Check out the Meatless Monday movement on Instagram as well, under hashtags including #meatlessmondays #meatlessmondays #savetheworld #goodkarma #savewater #dotherightthing #nofactoryfarming #anticruelty #humanechoices #healthychoices #healthyliving #vegetarian #kinddiet and many more. Try it and feel the positive impact you’re making. Pause, focus on those good outcomes on the way and feel that boomerang coming right back to you in the form of the health, happiness, joy and well-being you are adding to the world. Older →Women’s March Across the U.S.